Passport Grand Touring travel trailers provide you with everything you need to make memories with your family, all in an incredibly lightweight, affordable and features packed unit. From chassis that are engineered specifically for each floorplan to fully welded outriggers, this high quality unit has much to offer you. Read our Grand Touring review to learn more. Your kitchen is where you spend a lot of time. After all, the way to anyone’s heart is through their stomach! If you enjoy serving delicious meals to your family or simply like experimenting in the kitchen you’ll love how Grand Touring’s kitchen comes standard with an extra large double door refrigerator, a microwave with a carousel, 3 burner high output range, and residential hardwood cabinet drawers. From plush residential furniture to durable residential linoleum, you can rest confident that the Grand Touring’s living area is second to none! After a long day of enjoying the great outdoors you can come home to a residential entertainment center than includes an LCD HDTV and digital TV system. 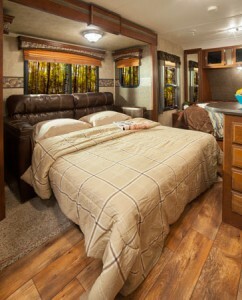 While most RV bedrooms can appear cramped, Grand Touring offers a ton of space in the master bedroom. This includes a queen sized Serta mattress, oversized wardrobes to accommodate all of your clothing and shoes plus extra, a tasteful quilted bedspread. The Passport Grand Touring’s bathroom offers much of what you would find in higher priced RVs. This includes a pedestal foot flush toilet, tub surround with built in shelves, a radius shower curtain, and a skylight over the shower (in most floorplans). With Grand Touring there’s one this that’s glaringly obvious: you don’t have to pay an arm and a leg for luxury living. You can give your family what they deserve, all within a price point that will keep you smiling. 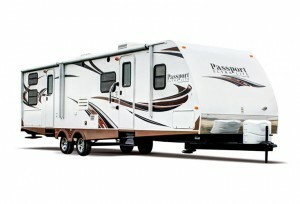 View our selection of the Passport Grand Touring online or contact us with questions. Unlike larger dealers we provide our customers with incredible service and promise you won’t encounter any hidden shipping or prep fees. The price we quote is the price you pay!